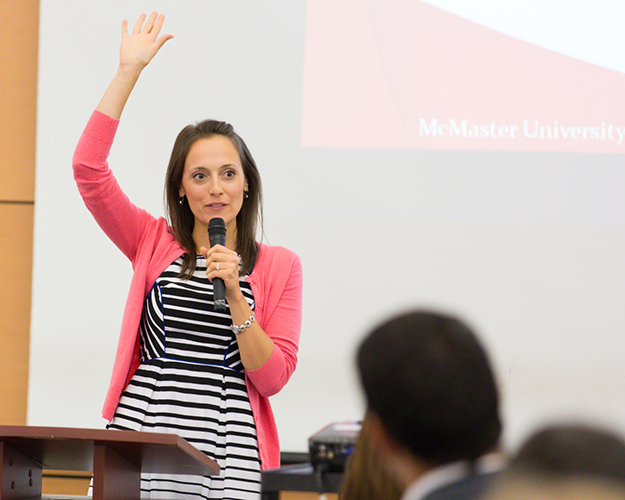 Kinesiology doctoral student Jennifer Tomasone delivers her winning presentation to students, staff and faculty gathered in CIBC Hall for the 17th Annual Graduate Student Awards. Tomasone won both the Dean's Award for Excellence in Communicating Graduate Research and the GSA Keith Leppmann Teaching Assistant Excellence Award. As part of this year’s Welcome Week activities, McMaster’s graduate student community celebrated staff and faculty achievements at the 17th annual Graduate Student Awards. Nominees and supporters from all faculties gathered in CIBC Hall to honour excellence in research communication and knowledge mobilization, the achievements of teaching assistants across the University and the important leadership roles taken by graduate students. “Once again, the number of nominees is a clear indication of the outstanding quality of graduate students, and the faculty and staff who support them, here at McMaster,” said Allison Sekuler, associate vice-president and dean, School of Graduate Studies. “Graduate students contribute so much to McMaster’s mission, serving as teaching assistants and mentors to undergraduate students and playing a key role in the outstanding research done here. But they’re also an important bridge to the broader Hamilton community, as they make an impact well beyond the walls of our campus — locally, nationally, and globally. Graduate student contributions are critical to the success of Forward with Integrity,” Sekuler said. The annual ceremony also provides an opportunity to acknowledge the invaluable contributions of faculty and staff in the graduate community. This year marked a record number of nominees for the President’s Awards for Excellence in Graduate Supervision, with 29 supervisors put forward across all faculties. The number of awards was expanded from two to six, honouring supervisors in every faculty. McMaster president and vice-chancellor Patrick Deane; David Wilkinson, provost and vice-president Academic; Aaron Maxwell, GSA vice-president Services; and Peter Self, assistant dean, Graduate Student Life and Research Training, joined Sekuler to speak or present awards Sept. 6. The Graduate Student Awards are a joint initiative of the School of Graduate Studies and the Graduate Students Association. Visit the Graduate Studies website to view the full list of 2013 nominees. As part of this year's Welcome Week activities, McMaster’s graduate student community celebrated staff and faculty achievements at the 17th annual Graduate Student Awards. Nominees and supporters from all faculties gathered in CIBC Hall to honour excellence in research communication and knowledge mobilization, the achievements of teaching assistants across the University and the important leadership roles taken by graduate students. "Once again, the number of nominees is a clear indication of the outstanding quality of graduate students, and the faculty and staff who support them, here at McMaster," said Allison Sekuler, associate vice-president and dean, School of Graduate Studies. "Graduate students contribute so much to McMaster’s mission, serving as teaching assistants and mentors to undergraduate students and playing a key role in the outstanding research done here. But they’re also an important bridge to the broader Hamilton community, as they make an impact well beyond the walls of our campus — locally, nationally, and globally. Graduate student contributions are critical to the success of <em>Forward with Integrity</em>," Sekuler said. The annual ceremony also provides an opportunity to acknowledge the invaluable contributions of faculty and staff in the graduate community. This year marked a record number of nominees for the President's Awards for Excellence in Graduate Supervision, with 29 supervisors put forward across all faculties. The number of awards was expanded from two to six, honouring supervisors in every faculty. McMaster president and vice-chancellor Patrick Deane; David Wilkinson, provost and vice-president Academic; Aaron Maxwell, GSA vice-president Services; and Peter Self, assistant dean, Graduate Student Life and Research Training, joined Sekuler to speak or present awards Sept. 6. The Graduate Student Awards are a joint initiative of the School of Graduate Studies and the Graduate Students Association. <strong>Winners of the 2013 Graduate Student Awards:</strong> The President's Award for Excellence in Graduate Supervision <ul> <li>James Benn (Social Sciences)</li> <li>Kari Dalnoki-Veress (Science)</li> <li>Donald Goellnicht (Humanities)</li> <li>Geoffrey R. Norman (Health Sciences)</li> <li>Michael D. Noseworthy (Engineering)</li> <li>Mahmut Parlar (Business)</li> </ul> The Dean's Award for Excellence in Communicating Graduate Research <ul> <li>Kathleen Einarson (Psychology, Neuroscience &amp; Behaviour)</li> <li>Mark Embrett (Health Policy)</li> <li>Tram Nguyen (Rehabilitation Science)</li> <li>Lisa Rivard (Rehabilitation Science)</li> <li>Jennifer Tomasone (Kinesiology)</li> <li>Rachel Ward (Physics &amp; Astronomy)</li> </ul> The Dean's Award for Graduate Student Knowledge Mobilization &amp; Innovation <ul> <li>Lisa Kabesh (English &amp; Cultural Studies)</li> <li>Tram Nguyen (Rehabilitation Science)</li> </ul> GSA Millennium Award for Community Service <ul> <li>Frances Lasowski (Chemical Engineering)</li> <li>Anupa Jyoti Prashad (Health Sciences)</li> </ul> GSA Keith Leppmann Teaching Assistant Excellence Award <ul> <li>Diana Glennie (Medical Physics)</li> <li>Jennifer Tomasone (Kinesiology)</li> <li>Douglas Wong (Political Science)</li> </ul> GSA Award for Contributions by Non-Academic Staff <ul> <li>Marianne Chew (Pathology and Molecular Medicine)</li> </ul> Therese Quigley Award of Excellence for Graduate Student Leadership in Athletics <ul> <li>Matt Stork (Kinesiology)</li> </ul> Mary Keyes Award for Outstanding Leadership and Service to McMaster <ul> <li>D'Andra Parker (Medical Sciences)</li> <li>Rebecca Seymour (Nursing)</li> </ul> Visit the <a title="Graduate Studies website" href="http://graduate.mcmaster.ca/news-and-events/sgs-news/791-celebrating-excellence-in-mcmasters-grad-student-community " target="_blank">Graduate Studies website</a> to view the full list of 2013 nominees. A 45,000 square-foot addition, improved energy conservation and enriched science and engineering research facilities characterize the now-completed renovations to McMaster’s Arthur Bourns Building. One of McMaster’s rare corpse flowers is all set to bloom – just don’t breathe too deeply.